A colour slide of an aerial view of Whitby looking north. In this view the subdivision of West Lynde is in the foreground. 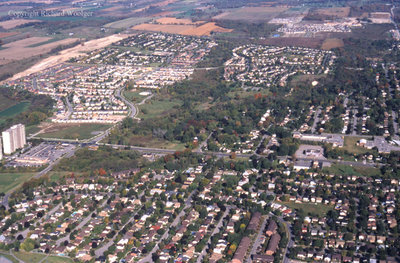 Highway 2 (Dundas Street) is in the centre of the photograph. Aerial View of Whitby looking North, October 7, 1998, Richard Woolger. Whitby Archives A2014_014_018.